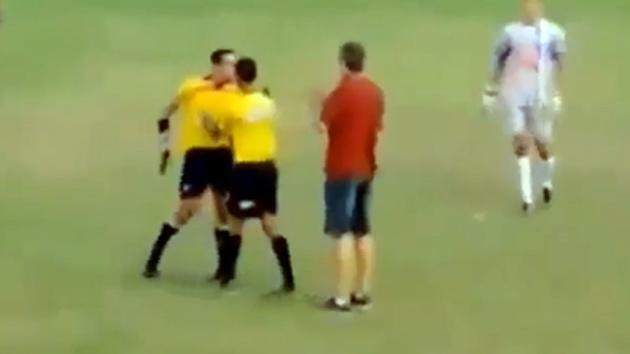 Watch as soccer referee gets his gun to control players! We are not the world’s biggest fan of referees. Sure, they have a thankless job, but too often they seem to want to be the story in a football match: not a part of the story, but the story itself. Grrrrr. Brazilian lower league official Gabriel Murta reacted to being slapped and kicked by Amantes de Bola, so raced to the dressing rooms and returned brandishing a gun. This got the players’ attention, some of whom fled the pitch in terror, as the man in black contemplated terminating the match in Brumadinho near Belo Horizonte with extreme prejudice. Murta now faces disciplinary action and is due to undergo a psychological assessment later today and could face suspension or a permanent ban. Bozzano said: “The Minais Gerais Football Federation has already summonsed the referee and a psychologist to a meeting and I’m going to talk with him today. “On the basis of that conversation and his account of events and the results of the psychological assessment I’ll decide what if any measures to take. Diego Costa, Luis Suarez. You have been warned. Who is the worst referee you have watched, and why? Comment now! Wanna know what it feels like to be in a mass shooting? This video shows you. As a father whose daughter just trailed round the world doing the gap year thing, this story made my blood run cold. It was their third night in the historic French Quarter of the city and by 2.45am, it had stretched into their fourth morning. They were walking to the next neon-lit bar on Bourbon Street, barely halfway through their US road trip, when the crack of gunshots sent people running for their lives. At some point in the chaos a partial or whole bullet entered Ms Matthews’ mouth through her right cheek and exited through her top lip, causing extensive injuries to her gums, teeth and palate. At the time, she assumed a flailing hand had struck her in the face but when she stopped running, she realised her mouth was full of blood and teeth. Speaking from her hospital bed at Interim LSU Hospital, Ms Matthews told The West Australian that she felt lucky to be alive. “I have about 10 teeth left,” she said. “It shattered the top of my palate in four places and ripped my tongue in several places. “Because the bullet was so hot, it just ripped through my teeth and burnt a lot of my gums. They had to remove a lot of dead gum. The young male suspects in the shooting fled the scene, leaving two people fighting for their lives on a panic-stricken street. Sitting together on the pavement, their dream holiday now a nightmare, the desperate Perth women found help from an unexpected source. Over several hours in the emergency department, Ms Matthews had about 30 stitches put in her tongue and a metal support fixed to the roof of her mouth. She has since had a visit from New Orleans Mayor Mitch Landrieu and her mother Amanda has flown in from Perth to be by her side. Ms Matthews lives with her parents in Mt Hawthorn and she hopes to fly home this weekend. Sunday’s shooting was the third major shooting in Bourbon Street in the past three years. Amy in happier times. We wish her a full and speedy recovery. Ironically, Ms Matthews wrote a thesis paper at UWA examining gun use in the US. But she said her traumatic experience would not stop her returning to the country. “Because of last year and all the little kids who were shot, I thought something would definitely be done but it just shows you how embedded the whole gun culture is in the US,” she said. We can only agree, and wish Ms Matthews well. A very brave – and lucky – young lady. Perhaps authorities could at least make it illegal to carry guns in places that serve alcohol, at least? This was the third such gun battle in Bourbon Street in recent times. That disregard of others has marked a spate of New Orleans crimes, when passersby have been caught in the crossfire. Goyeneche, of the Metropolitan Crime Commission, cited a number of New Orleans incidents when young children were hit by stray bullets. As we keep saying, only a “war on guns” will reduce the number circulating in the America community, and in a community where 200,000 guns a year enter the illegal marketplace stolen from law abiding homes. To pretend, as some do, that nothing can be done about this problem, or that any restriction on gun ownership is an assault on Second Amendment rights, is simply not good enough. Just ask Amy. An intelligent and rather moving article on the vexed issue of guns in America – from a longtime American gun enthusiast. We are on record as saying that we think there are far too many guns in circulation in America, and that the very prevalence of them both encourages and creates the appalling gun death and injury statistics that the country endures on a daily basis. To us, the logical conclusion of the pro-gun National Rifle Associations’s position is very simple: it is that every American should carry a firearm, in almost every conceivable situation. But we do welcome those on all sides of the debate who believe it should be conducted with civility, with deep thought, and with respect. Which is why we find this article so encouraging. It questions the current pro-gun environment in America, but in a gentle, thoughtful way, and from the perspective of a pro-gun individual. We recommend it. Do yourself a favour, and click the link. Joseph Wilcox, with his mother, who died attempt to stop Jared Miller in the recent shooting in the USA. He was shot in the back by Amanda Miller. A hero? Very possibly. But what is also certain is that he is dead. There. aren’t you glad you did? Whatever the solution to the situation with guns in America, one thing that should enrage us all is that facts so rarely seem to get produced in the debate. And whatever the solution might be, the facts in the infographic below need dealing with. Why care? Why care about what happens in Georgia or Illinois or California from our neat suburban homes in Australia? Why get involved? Why stick our noses in, uninvited? Well that’d be because we have many great friends in America, many of whom have had a close shave with gun-related violence. And because national borders should not stop us from providing advice to friends. Especially when the price of the situation not being dealt with is the same ghastly roll call of dead innocents, and so many of them innocent women and children gunned down in family violence, or in what seems to be the uniquely bizarre and tragic “school shootings” that plague the country. Should we care less about a kid shot down in Sandy Hook that we would if it were down the road from us in Australia, France, Russia, Britain, Korea, Japan or anywhere else? No, we should not. A kid is a kid. A Texan blogger nails it: Pro-gun laws are essentially racist. or maybe semi- automatic weapons on your street corner. How about a bunch of Muslims, say in full Arabic cultural dress and regalia, outside your local Church? At your local kids’ football game? Perhaps your favourite local restaurant? Is that something all you pro-gun people would feel comfortable about? Or is the right to bear arms limited to whites? This is the question the NRA and pro-gun people consistently duck, and should be called to task over. Only takes five minutes to read this article: click it now. Brandon Holt. Dead. Never coming back. Aged, 6. I do not pretend or propose to know what to do about gun control in America, and ultimately it is up to the citizens of that country, of course, but something needs to be done to stop tragedies like this happening. New Jersey gun owners who know minors could have access to them are required by law to properly secure the guns. Securing methods could include using a container box or a trigger lock. Failing to do so could lead to disorderly persons offence, a misdemeanor. It would be easy to yell “stronger penalties” for people who don’t keep guns safely under lock and key but then again, a family has lost their child. Another family has to live with the knowledge that a gun stored under their bed has killed another child. They must all be utterly devastated. I can’t see that punishing them further is going to serve any purpose. So what is the answer? Education? Stronger controls? You tell me. I just know the current situation is not working. The sheer numbers of guns in that society means such tragedies are inevitable. At what stage does the “return” on having guns in society get outweighed by the negatives. I really don’t know. I just mourn. A 6-year-old boy who was accidentally shot in the head by a 4-year-old playmate has died from his wounds, authorities said Tuesday night. The 4-year-old, whose name was withheld, was not injured. Prosecutor Joseph Coronato, speaking earlier Tuesday at a news conference, said the boy got the .22-caliber rifle from his home and it discharged accidently Monday evening. The children, whose families live in the neighborhood, were about 15 yards apart. The younger boy’s mother called 911 to report the shooting, Coronato said. Coronato said it was too early in the investigation to know whether anyone would be charged. 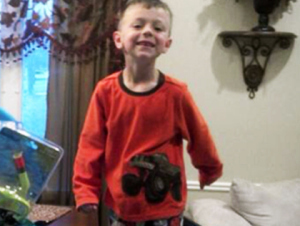 He would not say who owned the gun or speculate on how the 4-year-old got it. Mastronardy called the shooting tragic and said it affected the whole community, a sentiment shared by those who live there. Coto said the 4-year-old’s mother seemed very upset in the minutes after the shooting and appeared to be trying to comprehend what had happened. The shooting came just days after a 4-year-old boy in Tennessee grabbed a loaded gun at a family cookout and accidentally shot to death the wife of a sheriff’s deputy and amid debate over gun control laws in the wake of December’s Newtown, Conn., elementary school massacre.